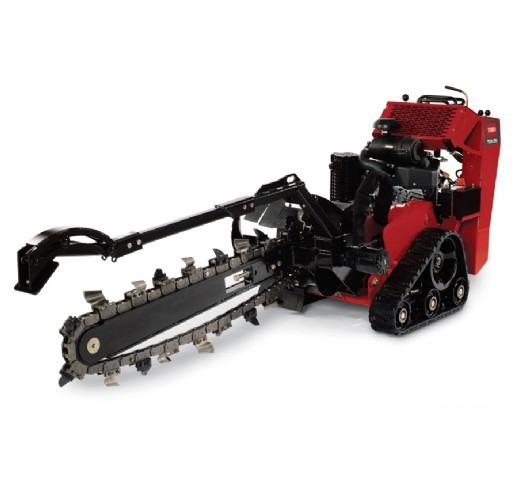 The Toro TRX26 walk-behind trencher redefines dedicated walk-behind trenchers, setting a new standard for ease of use – so intuitive and simple to operate with its TRX control system. It works faster and straighter than you would expect from a walk-behind trencher. The track drive design provides a low centre of gravity and a large light footprint, offering stability and increased maneuverability – without causing damage to existing turf. The TRX26 walk-behind trencher also makes valve box installation a snap with its ability to cross-trench without damaging trench sidewalls. the patented Toro TX traction control system, utilizing on-pump neutral centering systems.